This book is a hands-on guide to grievances and arbitration. Federal sector arbitration decisions, through 1998, are comprehensively analyzed with references to FLRA, MSPB, EEOC, and court decisions. This is an invaluable resource for both the novice and the experienced advocate. 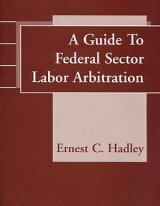 If you are an arbitrator, an attorney or agency representative involved in the arbitration process, this book is an essential addition to your reference library. For arbitration cases after 1999, refer to A Guide to Principles of Federal Sector Arbitration by Peter Broida and Natania Davis.